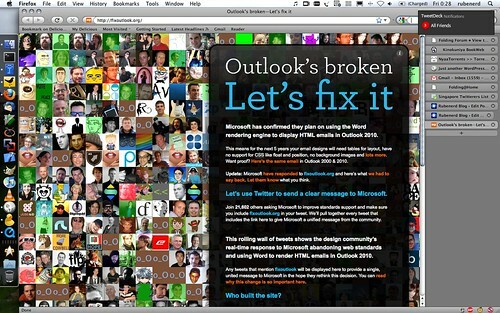 Rubenerd: Don’t fix Outlook, ditch HTML email! Don’t fix Outlook, ditch HTML email! There are reports circulating the intertubes that Microsoft will be using the Microsoft Word (or Microsoft Office Word or whatever mouthful name they've chosen now) rendering engine for Outlook 2010, their personal disinformation manager. Well meaning websites like FixOutlook.org that is so popular with Twitter folk demonstrate with screenshots this move will break rich HTML email message formatting. I'm frustrated by this story, not because of the rendering engine change but rather because there's a debate about this at all. In my view (grilled cheese pun) email with HTML to change appearance and layout is one of the most nonsensical online inventions of all time. Why? Spammers can include specially crafted embedded images to verify an email address is active and can include hyperlinks to malicious websites that unsuspecting users will click. Such messages take up far more disk space and take longer to download without really adding anything of value. When fatigued people get hundreds or thousands of messages a day, the last thing they need is superflous junk; just give us your message and move on! I've always opted to receive "plain" versus "HTML" messages, but sometimes I don't have a choice. Rich HTML email needs to be quietly shot, buried and never spoken of again. Not that I'm biased. Older post → Landscape iTelephone keyboard everywhere!